Your RV may have all the amenities you can afford to cram inside – a TV, air conditioning unit, shower heater, among others. Noticed that they commonly use 12 volts of power to operate? And they all rely on your RV deep cycle battery to provide your needs without interruption for as long as it can. You see, RV deep cycle batteries are built to house an enormous amount of power that allows usage of our living conveniences for a longer period of time. When these batteries are well-maintained, they can last for five years or more depending on usage. Without them, there is no way you can power up your 110-volt electrical devices in the middle of nowhere. Here are the advantages of VRLA deep cycle batteries over standard batteries. What type of RV battery should I use? What happens if I overcharge my RV battery? How does a battery cycle differ from battery life? What chargers do I use to recharge my RV battery? How will I make my RV battery last longer? A premium brand of AGM deep cycle batteries, the Optima BlueTop is a popular choice for marine applications, as well as for motorhome use. Its dual function of not only being a deep cycle battery but also as a starting battery makes it highly versatile. Maintenance-free: Being an AGM battery, it neither degrades nor spills, unlike the traditional FLA type. It is capable of suspending the electrolyte while maintaining contact with the active lead plates. As such, it has higher recharging and discharging efficiency. Spiral cell design: The spiral cell technology of the Optima BlueTop employs two near 100 percent lead plates coated with a lead oxide that have spiral-wound cells. In other words, it turns in a better performance than those with flat plates in their design. Energy-dense: The almost pure lead plates make for lower weight compared to another battery with the same capacity. More lifespan: For as long as it is charged properly, expect better longevity with the Optima BlueTop. It has been tested with up to 350 discharges, thereby increasing its life by threefold at most. Vibration-free: Given its spiral cell design, vibrations are significantly reduced, if not almost non-existent with this battery, making it the best in this category. Mount any which way: As a sealed type of battery, acid cannot escape it which makes mounting it in any position possible, especially for those with limited space in the vehicle. Double studs: This battery has a standard terminal (SAE) and threaded studs. The SAE stud is useful for attaching it to a charger while the latter makes a connection to power cables much easier. Higher CCA: The Optima BlueTop, with its dual functionality, has up to a 900 CCA rating that makes starting engines a hassle-free experience. Shorter capacity: Some users have noted this, but it is likely because of excessive power needs. Damage-prone: You have to be careful not to hit this battery accidentally as the damage caused may be irreversible. The Optima BlueTop is worth purchasing with its many solid advantages and very few limitations. That’s why it is at the top of my list. The Odyssey PC680 Battery is the brand’s top of the line product, having twice as much power as the other variants. The rugged design looks sturdy enough to take in a lot of punches under different weather conditions and terrain. No matter if you’re at sea or on land with an off-grid lifestyle, its longevity will surely take you on an odyssey (pun intended) of uninterrupted power for your electrical needs. Free from leaks and vibrations: The AGM setup means it is a sealed type of battery given the lead plates and its ability to absorb mechanical shock and vibration from the constant movement and even in extreme temperatures. Thus, spills are prevented by this heavy duty, yet lightweight battery. Quick recharging: It is considered as having one of the fastest recharge rates under the sealed battery category. A 100-percent recharge will only take between four and seven hours. Mountable Anywhere: This battery is flexible such that you can store it using any position, may it be upright or upside down, it doesn’t matter because of its spill-free feature. More life: It is touted as having more efficiency than a standard AGM battery. It gives a 70 percent life cycle unlike other deep cycle batteries and lasts up to 400 cycles with a higher DOD at 80 percent. This provides consistent voltage for longer periods. Better CCA rating: The Odyssey ignites engines, whether in extreme hot or cold weather with its high CCA grade of 170. That’s why it also runs excellently in frigid temperatures and remains active even with the heat. Missing technical support: This battery may come with a two-year warranty, but it seems difficult to get technical assistance when you need it. Weak power on a cold morning: While it is designed to work even in sub-zero temps, there have been comments on its ability to initiate in cold weather, and would require heating up before use. With its reasonable price, this Odyssey battery is a good buy that suits even the industrial land and sea vehicles. You are assured of a high performance that lasts. 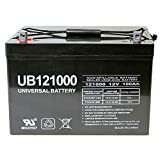 The third top battery pick in this list, the Universal UB121000-45978 is great for trolling motor and any consumer electronics using 12-volt systems. A physical description of this battery would be a thick plastic housing that is acid-proof, which makes for durable construction. High performance: This Universal deep cycle battery will not disappoint in terms of delivering consistent excellence in battery performance. The maintenance-free, sealed design is possible with the use of AGM technology that sets this type of battery apart from the regular lead-acid kind. Versatile: Like our earlier picks, you can mount this battery any which way you want because spillage is prevented. Its versatility extends to the many applications you can use this on such as golf carts, boats, electric wheelchairs, among others. Efficient: With a below three percent self-discharge rate per month, the efficiency of this AGM battery is very evident. Simply put, you will charge it less frequently, which prolongs your battery’s integrity as well. Its life is said to last up to five years given normal usage. High AH: This battery is rated at 100 amp hours to provide sufficient power for most equipment that requires a steady supply of energy. It normally takes half a day to charge it at 10 amps. Weight: You may find all of its 64 pounds at 12 inches long and 8 inches high, a bit of a turn-off. This battery packs a lot of poundage a.k.a heavy, making it quite difficult to mount and store. Insufficient stainless exterior: The stainless steel build is quite short and makes any supplemental connections difficult to install. You can count on this model to be a quality product that provides excellent power to any 12-volt electronics. Please note that this cannot function as a starter battery for your vehicle engine so you will need to get a separate one for that purpose. Truly one of the best batteries in the deep cycle segment, the VMAX857 is highly recommended for boats with trolling motors and other equipment as well. If there’s one thing that’s remarkable about the VMAX857, it’s the special structure of its plates which have gone through a chemical treatment improving its durability and performance. Rugged construction: Housed in a strong ABS container, it provides unique sealing technology without warping on the plates. Well-built grid: With the combined technologies of sealed lead acid and AGM, this battery also boasts of its tin and lead alloy battery grid. This structure extends the service life and enhances deep cycle performance even with frequent discharging. Compact design: The VMAX857 has all the features you would expect from an AGM battery such as being spill-free, no maintenance operation, shock-resistant, nontoxic, etc. What’s great about this is the lightweight size at only 25 pounds, measuring less than 8 inches in length. As such, it is easy to transport and mount in your vehicle. Fast recharging: Aside from the quick recharging capability, this battery has a less than two percent self-discharge rate, which is better than the 3 percent average. The DOD ranges from 50 to 60 percent for trolling motors. It can be charged using a smart charger and a microprocessor controlled rectifier. Long life: This durable battery is also long lasting that can stretch up to 10 years with average use. It can be operated in any weather condition without fail, given its CCA rating of 300 amps, making it work even in freezing temperatures. Shorter use during the charged status: One thing I wish could be better with this VMAX battery is its ability to hold power for long at a time. Unlike other deep cycle types, this doesn’t take long to lose its supply for example, when you leave your lights on for a while. Not as versatile: Unlike dual-purpose batteries, this one is only good for deep cycling use. You should not attempt to employ it as a starter battery. The 35-amp hour capacity makes it suitable only for small vehicles with lightweight trolling motors. The affordability of the VMAX857 makes it a worthy value purchase when you consider using it for light boats and other marine applications. Avoid over - discharging batteries, especially when they are in series connections. If you are using solar energy, the Renogy AGM deep cycle battery is best for the job. This battery prevents any leakage and requires no maintenance; it only delivers high-quality performance best suited for solar power storage. You can count on this battery for any of your electrical devices, even if used daily, or as a supplier of back-up power. 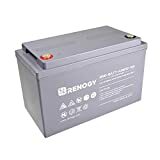 Multipurpose: The Renogy AGM battery can be used not only as storage portal of solar energy, but it is very useful in powering up your consumer appliances, portable tools, among electrical conveniences, refrigerators. It can also serve as an engine starter and possesses a 100-amp hour rating. AGM features: This battery made from ABS material comes complete with the advantageous features of AGM technology such as maintenance-free, spill-free, mountable anywhere, all-weather, and shock-free. Protection from overcharging: Given a series-type of connection, overcharging can be avoided with its use of lead calcium alloy grid. This makes for a low discharge rate so it is highly dependable on many applications. Explosion-proof: With the valve-regulated design that restricts venting, battery explosions are averted. Its outside shell protects the internal battery from burning in the event of an external fire hazard. Reliable performance: The Renogy battery boasts of a long life at more than 10 years considering average use. The gel electrolyte is spread inside and protected by a PE compound separator, which improves the integrity of the battery. Burdensome weight: At over 65 pounds, this battery is no lightweight, which limits the ease of transport. So if you’re looking for less poundage, you should cross this off from your potential list. The Renogy battery may be on the heavy side but its performance is highly satisfactory. It can hold the charge longer and carries out its tasks, particularly very well in hot temperatures. WindyNation 100 amp-hour, 12 Volt heavy duty deep cycle AGM sealed lead acid batteries with heavy duty plates are designed for deep, repetitive discharges. Ideal for all types of off-grid power: Solar Systems, RV's, UPS, Off shore Marine power, Telecommunications, Portable tools, etc. Staying faithful to the AGM sealed design, the WindyNation 12-volt battery can be used in a handful of applications with its sturdy deep cycling performance. The high-quality construction using non-conductive ABS material makes it vibration-proof and suitable for any kind of weather. A high number of applications: The WindyNation AGM deep cycle battery can operate any of the following: RVs, floor cleaners, golf carts, aerial platforms, inverters, off-grid telecoms, solar and wind energy storage, among others. Reliable deep cycle performance: Unlike other batteries whose life cycles are limited if not diminished by frequent use, this lightweight AGM battery can be recharged and discharged a thousand times or more, without compromising its efficacy. Worry-free: No need to put distilled water to maintain the battery, it comes perfectly sealed so that dangerous spillage is averted. This also allows the battery to be installed in any position and angle. You don’t also need to stress over harmful emissions, unlike in standard lead-acid batteries. Low discharge rate: This battery has an almost pure lead that provides it with a low discharge. As such, it is able to withstand deep discharges. And when it has been recharged, you can expect it to perform as great as it did the first time. It even has a reserve capacity of 240 minutes or 4 hours while holding a good amount of voltage. Vulnerability: Users have complained about this battery’s susceptibility to breaking which is said to be caused by the brass construction of the core and threads. Limited hub terminal: The short terminal is quite a hassle for this type of battery. The fact that this battery possesses important AGM traits is enough reason to consider it for your RV use. Compact yet extremely powerful, the space-saving design of the Odyssey PC925 is definitely one of its attractive characteristics. This deep cycle battery is capable of being a starter battery with its massive power and quick recovery that cater to most vehicle demands. It is a military-grade dry cell battery, making it a great choice for exacting vehicles. Longer life cycle: When you are talking about deep cycle batteries, having 70 percent more life is a good thing. This means it has up to 400 cycles with a DOD of 80 percent. And this battery’s got it and more. You can take advantage of its consistent high voltage for an extended period. Efficient recharging: This battery charges at 100 percent in less than 6 hours. That said, using your appliance for a full day would consume about 30 percent of its charge. Just don’t forget to recharge it accordingly and you will be fine using it without fail. Premium AGM technology: The Odyssey PC925 is so impressive that its AGM properties are taken to the next level. The no-spill, no-vibration, no-maintenance capabilities protect battery life. It even satisfies with the fact that it can stand up against the most unforgiving temperatures. Flexible mounting positions: The integration of glass mat instead of liquid makes any orientation possible. Whether it is positioned upright or standing on the opposite, this battery remains consistent with its energy supply to your devices. Starter capability: Its CCA rating of 330 amps offers enough power to ignite an engine, serving another purpose to this deep cycle AGM battery. Weight issue: Similar to some of the batteries in this list, the Odyssey is heavier than what is deemed comfortable for many RV users. Another battery option worth anyone’s consideration, the Odyssey PC925 is packed with features you would like a good deep cycle battery to have. A dual-purpose AGM battery, the Optima D31M can exceed your expectations on both as an engine starter and energy supplier for your appliances. Found in many vehicles like boats, cars, and other high-powered machinery, this battery belongs to group 31 that makes it even more equipped to provide unwavering power. Higher reserve capacity: This marine battery has a reserve capacity of 155 minutes with a DOD of 80 degrees Fahrenheit at 25 amps. In other words, you will enjoy consistent energy for a longer time. The low internal resistance ensures efficiency in power output. Durable design: The sturdiness of this polypropylene-cased battery assures the buyer that it will be capable of resisting vibrations that otherwise will easily damage it. Mounting is not a problem either, because the AGM design guarantees it to be free from any spill and leak. Fast recharge: A fast-charging battery is almost imperative in any application. You will appreciate that the Optima 8052-161 can be recharged in as fast as 6 hours, which will be dependent on the current flow and voltage. Thus, it has thrice the recharging capacity of a normal lead-acid battery. You can use either a standard charger with a maximum of 15 volts to recharge or an alternator. Impressive CCA: You must know that this battery has a CCA rating of 900 amps. So despite sub-zero temperatures, you can rest easy because the Optima will deliver without any problem. It is noteworthy to mention that it has maximum cranking amps of 1125, making it truly powerful when used in marine vehicles. Bulky and heavy: Measuring almost 13 inches in length and weighing about 60 pounds, this battery is not only conspicuous but can also take up so much space for storage. Sensitive to overcharging: While this may be an issue, you can’t go wrong if you follow the manual for charging instructions faithfully. The Optima D31M is indeed a powerful sealed battery. What makes it even better is that it can be purchased at an affordable price. A deep cycle battery that comes to the premium forefront is the Battle Born Lithium battery. Using a lithium iron phosphorous cell-type, it boasts of being light in weight but heavy in quality. Its flexibility is such that it can be used in multiple volt systems like 24, 36, and 48 volts aside from just 12 volts. Lightweight champion: Its size may be along the lines of other premium AGM batteries, but the weight is virtually feather-light at less than 30 pounds or 13 kilograms. It is the lightest battery among our deep cycle battery picks, yet it remains competitive with its performance and features. Versatile usage: Despite its lightweight feature, you can use the Battle Born battery with any application, may they be power systems for off-grid vehicles like RVs and boats, or function as a starter battery. When used for the latter purpose, you must remember that it only has a limit of 200 amps for half a minute. If you require more than this, you should use a parallel connection for additional batteries. Better charging cycles: LiFePO4 is perhaps the safest cell type that can hold a charge up to a year without calling for an added trickle charger. It can withstand up to 5000 charging and discharging cycles, and manage to keep a max battery capacity of 80 percent. It recharges with less time at only 2 hours or more depending on the charge current, which should never be 50 amps or more. 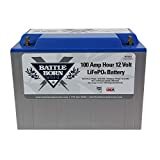 Pricey option: The Battle Born battery with all its high-quality characteristics and lightweight feature, does come at a higher price at near one thousand dollars. The lightweight feature of this battery is its greatest selling point, although it is also expensive compared to other AGM deep cycle batteries. But when you come to think about its much higher tolerance for charging and discharging, the high cost is quite justifiable. 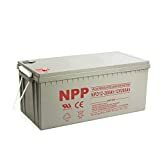 A durable deep cycle battery made of non-conductive ABS plastic material, this NPP AGM battery is capable of resisting heat, chemicals, and vibration. Installation is a breeze and you will not require a skilled technician to do it for you. You can use standard electrical appliances such as emergency systems, backup power supply, etc. High heat tolerance: What’s amazing with this product is its persistence even if temperatures reach as high 130 degrees Fahrenheit. With its rugged construction and multiple quality certifications, you can be assured that its operation remains safe from current and damage. The 225-amp hour rating can supply to the most power-hungry devices without a hitch. Fuss-free and easy to install: No need to refill with distilled water to prevent damage or complicated install procedures, this battery is great for a multitude of applications while delivering good quality performance. The compact size fits tight spaces and recommended for those with limited storage room. Affordable price: At under 500 dollars, you can power up your electrical devices without breaking the bank using two units of this battery. Drains faster: As observed by several buyers, the NPP 6-volt AGM battery has the tendency to use up its power supply faster than usual. Shorter warranty: While most deep cycle AGM cell-type batteries have 3 years upwards for their warranty, this particular model offers it for only one year. If you are the budget-conscious consumer who is always on the hunt for a good buy, then you will be more than happy to get this high capacity battery for your RV. Let’s differentiate one from the other by their energy supply. A house battery is designed to supply longer continuous power to electrical appliances. This makes using major appliances such as the A/C for days possible. If it doesn’t work that way, it will not be able to operate properly and for long. On the other hand, an engine battery is only required to fire up the RV engine itself by delivering high bursts of energy at an instant. So when your vehicle’s engine is already running, it already does it on its own without having the battery to continuously supply power to it. Also referred to as a starting battery, another difference it has from the house battery is its larger size and higher CCA (Cold Cranking Amps) rating, which I’ll discuss later in this article. For house batteries though, you could need up to 4 of them in a luxury motorhome, which can provide more than 1000 amp hours. An RV with not much need for electrical power can make do with just one battery that has about 50 amp hours. Earlier I mentioned about RV deep cycle batteries. So house batteries actually go through deep cycling- a process that requires discharging and recharging of the battery without damaging it. With this method, a deep cycle battery has more longevity and durability than your typical starting battery. Moreover, there is also its dual purpose battery model, which is capable of solar energy storage. It is important to emphasize that an RV battery does not produce power, it simply stores it as transferred from a source. It is a useful tool that supplies steady power to many RV appliances even when there is no electrical power grid available. Such creature comforts have to rely on a battery system of 12 volts in order to perform accordingly. That’s why you can achieve your home away from home lifestyle, and be able to regulate your indoor temperature with an AC, cool your drinks in a portable fridge, etc., all of which are made possible with your RV battery. As mentioned earlier, RV electrical devices use a house battery which I have already differentiated from a starting battery. A house battery is built to provide energy for an extended period of time, something that a starting battery is not capable of. Starting batteries have several thin plates that are maximized with their exposure to the electrolyte that provides that instant bursts of energy. As such, they cannot be used as an RV battery which requires a continuous supply. In order for you to provide proper maintenance and prolonged lifespan for your battery, you should understand what it really is and how it works in the grand scheme of things that is, the RV lifestyle. It is a little complex as you might think, but I’ll discuss the important aspects of voltage, amps, among other things. The battery that is commonly used in an RV is the lead-acid type. Lead acid batteries work by having series connections in their cells. Approximately, each cell has 2.1 volts. What you know as a 12-volt battery actually has 6 cells with a total output voltage of 12.6 volts produced in series. Lead acid batteries are typically made from lead plates, submerged in an electrolyte that consists of 64 percent water and 36 percent sulfuric acid. That said, they only serve as a storage room for electricity; they don’t make it. The battery that I have previously discussed in the house battery, used to supply 12 volts to RV amenities. House batteries should be deep cycle types, which are built with thicker plates to handle repeated discharge and recharge processes. Such batteries are rated in terms of amp hours and reserve capacity. When shore supply is available, this can power your RV devices using 120 volts AC power and at the same time, recharge your RV batteries. Monitoring the battery levels should be done to maintain its efficiency and longevity. If you see it running low, you should be able to charge it as soon as you can. If you’re going to plug it in to recharge, check if you have a converter so you don’t encounter electrical mishaps while you’re at it. You should expect a longer charging time as it is incapable of fast operation as you would want it to be. Prepare to wait before your battery becomes fully charged. It’s safe to say that RV house batteries should be deep cycle. Pumping water to the tank, or cooling your air with an electric fan is possible because of them. Practically every electrical device can be powered with the right battery setup. Deep cycle batteries have three salient points to them, namely: life cycle, build life and warranty. You would want your deep cycle battery to have superior construction that results to a higher life cycle and lower depth of discharge. Many low-quality batteries are rated with lower cycles, which will not make it last as long as the premium types. You should consider the build life when getting deep cycle batteries. The good ones can last up to 12 years, which is determined by scientific testing. Simply put, a longer build life means a high-quality battery. Deep cycle batteries come with a warranty, and some manufacturers are offering it for up to five years. Again, this is a good indicator of a quality product. These batteries come in two categories to suit a specific need. They are: flooded lead-acid (FLA) and valve-regulated lead acid (VRLA). Also referred to as wet batteries, the term flooded is being used due to an electrolyte fluid excess necessary to maintain the submerged plates. This electrolyte is composed of sulfuric acid and water. Ideally, the fluid level is filled on top of the plates. This serves as a reservoir to ensure that there will still be enough fluid to cover any water loss from charging the battery. This type of chemistry was discovered in 1859 by French physicist Gaston Plante, which became the first commercially-marketed rechargeable battery. As a deep cycle battery, a lead acid battery has long discharged and low current capabilities. It can be used in many applications, one being an energy storage component in an off-grid system such as in an RV. FLA batteries are suitable for a prolonged power supply with their ability to hold a high charge, deep discharge, and repeated cycles many times over. Each lead-acid cell is made of the following parts, which are the anode and cathode that form the electrodes, and the electrolyte. Inside it, there is a solid lead negative plate and a lead dioxide positive plate. Sandwiched in between is a separator that prevents short circuit and the contact of plates. When discharging occurs, the current flows from the negative plate with oxidation to the positive terminal. On the other hand, recharging does a reversal of the discharge process by converting back the lead sulfate into the lead and sulfuric acid. During this time, it also removes sulfate crystals, which can potentially damage the plates. The thickness of the plates come to play here with the frequent charging and discharging systems because the positive plate becomes corroded in the process. That is why a thicker plate will provide more lifespan to a battery than a thin one. VRLA batteries also called sealed lead acid and maintenance-free batteries, are built to function via an internal oxygen cycle. During this process, oxygen evolves in the latter stages of charging and overcharging the positive electron. The sealed feature prevents any leakage. The VRLA battery improves the earlier FLA type by preventing gas buildup that may cause a battery explosion. It is done by restricting electrolyte movement and trapping the hydrogen on the plates for recombination during a battery recharge. This system reduces water loss, which makes for its maintenance-free feature and keeping it sealed. This also accounts for having no required positioning of the battery. They generally have a low discharge rate of 1 to 2 percent each month. They have a longer lifespan. They can be used in saltwater applications like powering up a motorboat. They can be mounted in any position without any spillage. They can store in a tight space. They diminish the occurrence of terminal corrosion. VRLA batteries come in two types: the gel cell and absorbed glass mat (AGM). These VRLA batteries have a jellylike electrolyte produced from a mixture of sulfuric acid and silica as thickening agents, hence they’re called gel cell. The immobility of this gel makes it possible for the battery to be mounted in any position. This battery type is used in very deep cycle applications and also works well in extreme temperatures, absorbing shocks and vibrations at the same time. Although not as common as the other VRLA batteries, gel cell batteries are used in electric wheelchairs, generators, and vehicles. The recharging voltage of these batteries is considerably lower than the other battery types. However, the gel cell is perhaps the most sensitive when it comes to overcharging, which can cause adverse reactions on the voltage. The voids this creates in the electrolyte becomes an irreversible damage. And because of this, many people avoid using this battery, especially those that do not really understand battery technicalities. The AGM is an upgraded lead acid battery providing superior power to devices with higher electrical demands. Instead of using a gelled electrolyte, it has what is referred to as a recombinant gas-absorbed electrolyte. This characteristic almost entirely eliminates water loss during which, the gases recombine inside reducing their emissions in the process. For these VRLA batteries, acid is absorbed, and its movement is restricted by ultra-thin fiberglass mats located between tightly compressed plates, as opposed to flooding them, as the case is with FLA batteries. Theoretically speaking, this design enhances the efficiency of the discharge and recharge processes. The internal compression protects the plate material from too much shedding brought about by frequent cycling. It also enables the acid to be accessible to the plates, allowing quick reaction. AGM batteries are flexible in such a way that it allows any shape of the plates without affecting their integrity. The low internal resistance from the element compression and its quick acid flow provide such batteries with high amp ratings during charging cycles. They can meet higher current demands and last longer even with a deep cycle. The AGMs are generally lighter than FLAs. This battery type is sealed, prevents acid spillage, making it the ideal choice of ATVs and motorcycles. It is also used to house power from solar and wind installations. And because the AGM does well in colder temperatures, it is the preferred battery for marine and robot applications, aside from high-end industrial vehicles. Unlike FLA batteries which need maintenance using distilled water, and a topping charge twice a year, AGMs require none of these. They offer less risk of sulfate accumulation, therefore allowing longer storage without being damaged up to one year. From this hibernation, it can be recharged without a hitch in case you want to use it again. Another important feature of AGMs is their lack of hydrogen emission during a charging cycle. Thus, they don’t require proper ventilation during this process, making it safe to use in your RV. And during the winter season, frigid temperatures can wreak havoc on any vehicle, including the battery. Fortunately, these batteries don’t freeze up and remain stable all throughout when charged with their higher CCAs. If there’s one thing to avoid doing on AGMs, that is not to overcharge them. Aside from being an RV battery, AGMs can also be starting batteries when you consider the lower CCA of its deep cycle variant. Usually, they should be upsized by twenty percent to match the amount of cranking amps from a regular deep cycle battery. Another type of battery that uses deep cycle technology is the lithium-ion battery (LIB). A more recent invention which first came out in the 70s and has seen widespread use in the 90s, it uses lithium compound as an electrode instead of metallic lithium found in its disposable variant. By limiting its DOD by 80 percent of its rated capacity, its battery life will be significantly increased. Below is a quick comparison between LIBs and lead-acid batteries. LIBs are much lighter in weight. Lead by itself can be weighty, which makes lead-acid batteries more than thrice heavy compared to LIBs. LIBs are deemed safer with their integrated safety mechanism where it shuts down once they are near extreme heat temperatures. LIBs are highly efficient at charging and discharging compared to lead batteries. There is amp loss with the latter, which decreases the battery capacity. LIBs are capable of virtually 100 percent discharge compared to lead batteries which top out starting at 50 percent and never more than 80 percent. LIBs have more life cycles, reaching 800 compared to the 300 cycles of lead batteries. The life cycle of a LIB is not affected by the discharge level, unlike a dead battery which is highly dependent on it. LIBs have better voltage consistency than lead batteries which typically experience a drop every now and then. While LIBs may be slightly expensive compared to lead acid batteries, you will likely save cost in the long run if you factor in their efficiency and lifespan. LIBs are far superior to lead batteries with their less environmental impact given their capability to decrease carbon monoxide emissions when in use and their recycled composition. Nonetheless, the use of lithium batteries has been considered a big step in the right direction, especially for off-grid living. Just like other consumer products, not all RV batteries are alike. One may have more amp hours than the other. That’s why picking the best battery system is crucial so that all the creature comforts in your rig are working properly. It’s not enough that you have the best deep cell battery setup in your RV. You have to learn how multiple batteries should be connected so that you will get the correct capacity for any of your RV applications. This capacity can be rated in terms of ampere-hours or AH. The amp hour rating measures the number of amps a battery can provide in a given number of hours before it gets discharged. This is computed by multiplying the values of the amps and the corresponding hours. I’ll use a 100-amp hour rating as an example. This could mean it can deliver 5 amps for 20 hours before discharge. At the same time, it can be used to deliver 20 amps for 5 hours as these equal to the 100-amp hour rating. Or, it can also provide 100 amps for an hour. Then there’s reserve capacity or RC, which is the value in minutes that the battery can provide 25 amps at 80 degrees Fahrenheit before it goes down to less than 10.5 volts. You can also derive your AH rating from the RC by multiplying it to 60 percent. When you use many electrical appliances in your RV, you will consider the high-capacity type of battery. This will be more equipped to store large amounts of power for much longer. In other words, the more appliances you will use, the higher your battery capacity should be. Be conscious of the battery size and weight as having more connected batteries means more space needed to house them in your RV. Deep cycle batteries have designated group sizes such as 24, 27, and 31. To check the appropriate capacity for your RV, it will depend on your energy needs on a daily basis. You then have several options for your battery setup. You can get one group 24 battery with 12 volts, which can deliver up to 85 amp hours. Or use two of these group 24 batteries that have parallel wiring, as they will be capable of up to 170 amp hours, with voltage remaining at 12 volts. Noting the reserve capacity, you should make sure to use a battery that works more than 60 percent, especially if you are going away for days in your RV. Interestingly, there are deep cycle batteries that allow recharging by different power sources. These include solar power, electric hookup or a generator. Also referred to as DOD, the depth of discharge is another factor to consider when buying an RV battery. This is named as described – it measures how deep the battery has been discharged. For instance, a fully charged battery will have zero percent DOD. When there is 70 percent left, this means a DOD of 30 percent. Deep cycle batteries are made to be discharged by up to 80 percent every now and then. Their thicker solid lead plates give them less surface area than starting batteries. A lead acid deep cycle battery would have more than 1000 cycles at 50 percent DOD. In other words, the lower the DOD, the higher the cycle is. For RVs, starting and house batteries that are deep cycle are rated for 12 volts DC. When there is enough space for batteries in the rig, most RVers utilize two 6-volt batteries in lieu of one 12-volt battery. Series wiring is required for this setup to deliver the 12-volt requirement while keeping the amp hours the same. If you still need more, you can even use for 6-volt batteries with series and parallel wiring to increase both your voltage to 12 volts and double the amp hours. When you have solar power or other types of chargers, they can work with high voltage batteries such as 24 volts. In this case, though, you will require an inverter in order to convert to AC from DC with your battery. What chargers should you use for your batteries? Will you be using solar power, short supply, or your RV generator to charge them? You can take comfort in the fact that you can use any of those, in fact, you can combine all of them. Alternatively, you can also get a charge controller or a smart charger. This device displays the charging info which you can use as a reference for the appropriate charging time of your battery. Meanwhile, the charge controller is usually a small box placed between the power source and the battery. These sources could be solar panels, plug outlet, or a power generator. It regulates the amount of charging from the source flowing into the battery bank to prevent it from overcharging as protection. The supply of energy of a battery can depend on the ambient temperature. You can get an optimal battery performance with a moderate climate at 77 degrees Fahrenheit. However, there are deep cycle batteries such as the sealed types which are designed to work during winter. In this situation, the cold temperature will still increase the internal battery resistance while decreasing its capacity. That’s why some people would store their batteries indoors to avoid the negative effect of sub-zero temps outside. As for higher temperatures, heat basically kills batteries. Essentially, for every 8-degree rise in temp, half of the life from a sealed lead acid battery is lost. Temperatures of over 95 degrees Fahrenheit diminish load capacity and reduce the lifespan of the battery, increasing its discharge rate in the process. Remember to choose the battery that suits the climate it will be used in. Wet cell batteries are typically susceptible to impact and vibration while the opposite can be said about gel and AGM types. Deep cycle batteries are able to absorb shock and resist vibration pretty well, better than any standard battery, making them ideal for RVs. They may have lower amp-hour ratings than traditional battery constructions, but their sturdy designs are highly recommended for high-performance applications and wherever strong vibrations are likely to present. Now that you have learned about RV deep cycle batteries, you should check out the many options in the market. I have come up with my top ten, with the following that have made the cut. It’s always good to use a deep cycle battery for your RV instead of relying on your vehicle’s starting battery. As discussed earlier, deep cycling means you can discharge and recharge the battery many times over. During each charged state, you can use it to supply continuous power to your chosen application/s. A starter battery will not be able to perform at this level given its limitations; it can only provide an instant high burst of power for a short time. Perhaps lithium-ion batteries are the best deep cycle option because of their performance and lightweight size. However, this battery is priced much higher than other deep cycle types. FLAs are cheaper, but they require water maintenance. As such, SLAs which are maintenance-free variants may be considered. Once you have chosen the type of RV battery, factor in the amps, operating temperature, storage, among others to get the right one for your needs. Overcharging batteries can corrode plates prematurely and lose water, which will lead to battery failure. For gel batteries, it can cause irreversible damage to the cells and die before they’re due. That is why more often than not, manufacturers warn against this when you buy VRLA batteries. And often, regulators or charge controllers are recommended to protect an overcharge. These two terms may refer to the same thing and are actually related to one another, but differ by definition. A cycle is a set of one discharge and one recharge. Factoring in the depth of discharge, a battery that’s said to have 500 cycles given a DOD of 50 percent, will achieve optimal performance. On the other hand, the lifespan is the period of time a battery can function before it practically dies down. This is directly connected to the DOD during battery usage. For example, if you subject your battery to an 80percent DOD every time, by estimates, you are cutting your battery life in half. This does not necessarily mean going 80 percent DOD is entirely prohibited, but by virtue and to maximize your battery, you should follow your DOD which is 50 percent for most. While most deep cycle batteries can be charged using a smart charger or generator, there are other chargers you can use for this purpose. There’s the basic converter that converts 120 volts into 12 volts DC power and at the same, it can charge your battery when there is extra capacity. An inverter does the same thing, but instead, it can produce 120 volts AC from a 12-volt battery. There are single and multi-stage chargers. The single stage charger is common in older motorhomes. The multi-stage type is a modern device that uses three stages, namely bulk, absorption, and float. These keep the battery safer for a much longer time, which make the multi-stage charger a better option than the single stage. Then you can use an innovative charger such as a solar panel. Typically a 100-watt large solar panel can power up your entire day’s use of energy. A wind charger can be a novelty option as well by having a propeller drive an alternator. This will provide an energy surplus to recharge your battery. A trickle charger is a small unit that maintains a 100 percent charge on your battery, which uses a single stage design. On the other hand, an echo charger does not exactly recharge the battery but combines and switches energy between two types of batteries. This is a great way to charge one battery with a house battery and act as a backup power supply. An RV deep cycle battery generally lasts for 6 years or more. If you want to extend it further, proper care and maintenance should be implemented. Basically, you should recharge a discharged battery in a timely manner to avoid sulfation, which is when small crystals are formed on the plates. If they remain long enough in the discharged status, this can ruin your battery. We know that 12-volt batteries actually have 12.6 volts, so you shouldn’t allow it to discharge below 12 volts or a DOD of 50 percent. This can be measured using a voltmeter. Going beyond 50 percent will essentially reduce your battery lifespan when it happens frequently. You must be aware of the parasitic load on your RV that can quickly discharge your battery. They include the TV antenna booster, stereo, and circuit boards. So it’s good for your battery to have a disconnect switch when it’s not in use. I would like to reiterate that overcharging is not good for batteries unless the variant you are using has a protective mechanism for this. For FLAs, never use tap water as it can bring about calcium sulfation. Distilled water is the only kind you should refill your FLA battery with. And it should be done after charging except if the plates are exposed. Furthermore, the housing of your batteries is recyclable and you can always trade it in whenever you buy a new one. Always note the limitations of each type of battery such as the amp hour rating, discharge rate, etc. all of which have an impact on the battery’s capabilities. Stay powered!